Unplugged all 5 battery tenders as I can finally try to get them out of the house soon. The snow piles have finally melted. Just need to wait for the grass to dry out and for all that fcvking sand to get swept up from the streets. I got a little carried away with spring cleaning.. Replaced the PDS bearings, and repacked the swing arm, and stem bearings. New expansion chamber orings and polished the pipe. Friday I trailered the BMW back to my garage from storage. I had taken the battery out to store it. Why didn't I drop the battery back in at the storage garage? Because it is under the tank. And the tank is only held on by 1 bolt, but the rear plastics, oil cooler covers, and oil coolers are all attached to the tank. I'm getting pretty good at it, it goes pretty fast when you are someplace warm. New shoes for the Tiger. Hopefully this will make is not handle like a slip and slide off road. These are the 804/805s, they look like they’ll be great off road. On road will have to see, I do ride the tiger a little harder than it was intended. Took the peg feelers off because they kept smacking down. Definitely gonna ease into the new rubber before I try to rail it like I did on the old set. Be careful on road with DS tires. There's significantly less contact area and the tread will flex a lot more than street tires. I used to regularly break the rear loose on my DR650 just in "normal" acceleration while cornering. Did the so called triumph “12 minute tune”. 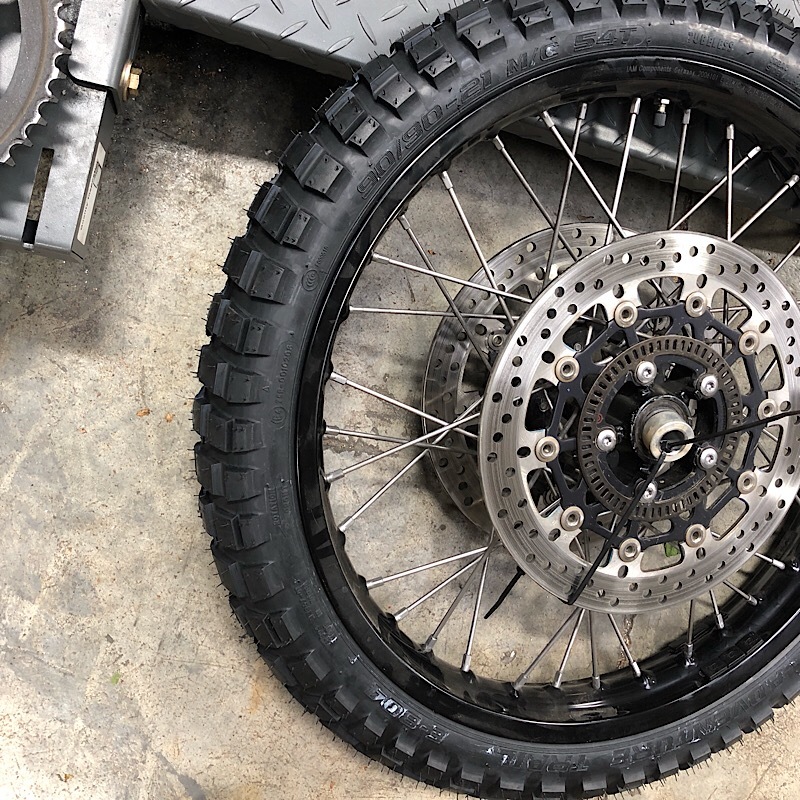 Start the bike and let it idle until the fans kick on, then let the bike idle for 12 minutes without touching the throttle. Basically resets the adaptive ecu to a good base map, suppose to smooth the fueling and idle out, and a bump in mpg from what I read. It did seem to make a difference in the idle, short trip around the ‘hood seems to suggest it’s a little smoother. Now that is the kind of mechanic work I could probably do for myself without substantial risk of screwing it up. Start it and let it run for about 15 minutes without touching it and then turn it off. Is the valve adjustment similar? 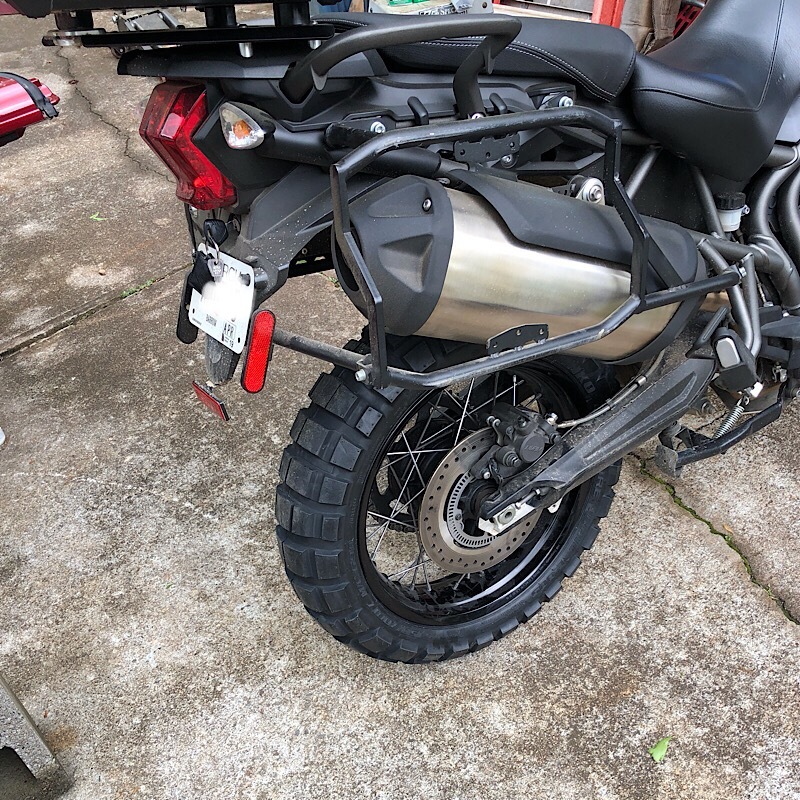 When I was researching for a new ride I had the fortunate opportunity to ride a Triumph 1200 with a new set of those tires for a full days romp around the Arkansas good stuff. They performed very well in the twisties...I was quite surprised. They bike/tires could handle a pace that would run about as fast as one would want to go on twisty public pavement. Most excellent for the price. Agreed. Even with the dual sporty tires, I don’t think I’ll have a problem running a nice comfortable pace. Truly a superb all rounder. The valve adjust is also super easy. Same shim under bucket design we're all used to. Only triumphs cams are held in by a one piece girdle. Remove covers and take off CCT and mark gears and chain. Loosen all the bolts in sequence and pull the girdle off, simply lift the chain off each cam gear and pick the cams up and slide them out. For the throttle body adjustment, plug your laptop into the OBD2 port under the seat, and load the free software to read the ecu. That’s right, it’s all done electronically, no fiddling about. But that doesn’t mean it’s without its quirks. Google the idle stepper motor on these and read of all the grief. Requires periodic cleaning or can cause rough idle/stalling. Or you can put a Daytona 675 racing manual idle adjuster on and be done. And the air filter is a chore to change. Most put a uni pre filter snorkel on so they don’t have to check the main filter as often.